← A pair of sweet little vintage budgies. 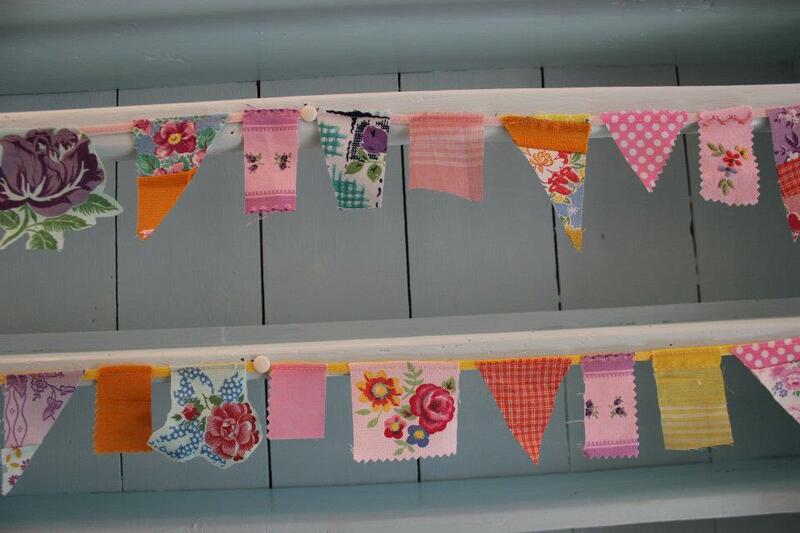 I’ve been making vintage bunting for many years and now I also make vintage patchwork bunting and mini vintage bunting (pictured). My bunting isn’t the sort which is used to decorate large venues, marquees or streets. I source my fabric from all over the world. Some of it was handmade in the thirties and forties. Some is hand dyed. The sort of colours and patterns I like weren’t too difficult to get a few years ago, now unfortunately it’s like gold dust so every little piece is precious. I add small pieces of gingham, polka dots and muslin and make it by the meter. Each little piece is like a jewel and I cut them all differently and I also dye some myself so that each string of bunting is a beautifully precious little collection of quality vintage fabric in glorious ice cream colours.